I wake up to lilting melody of the Cloud City theme playing outside my room. A moment later, the public address system crackles to life. I’m expecting Lando Calrissian to tell us that the Empire has seized control and we’d better evacuate. But it’s just the Cruise Director of the Disney Fantasy, letting us know that Star Wars Day at Sea has begun. It was supposed to be just another trip around the Caribbean aboard the Disney Fantasy. Same ports as always — Cozumel, Castaway Cay, Castillo del Mar. But things got off to a Yub Nub start when we pulled up to the dock at Port Canaveral to find Warwick Davis unloading his bags right from the Uber BLACK right in front of us. I took it as a good omen. Han and Leia started their relationship in a trash compactor and look where they ended up. Warwick Davis, of course, is Star Wars royalty. He played Wicket the Ewok in Return of the Jedi and has appeared in virtually every Star Wars film since — including the upcoming Solo: A Star Wars Story. The only reason he was on the Disney Fantasy in the first place was Star Wars Day at Sea — a special event on select Disney Cruise Line sailings where Darth Vader takes over the ship at midnight, then spends the entire next day force-choking you with all things Star Wars. Velvet ropes protect this cardboard display like the shield generator on the forest moon of Endor. This was perfectly fine with me. I’ve been hooked ever since I saw Empire Strikes Back in a Midwest theater back in 1980. 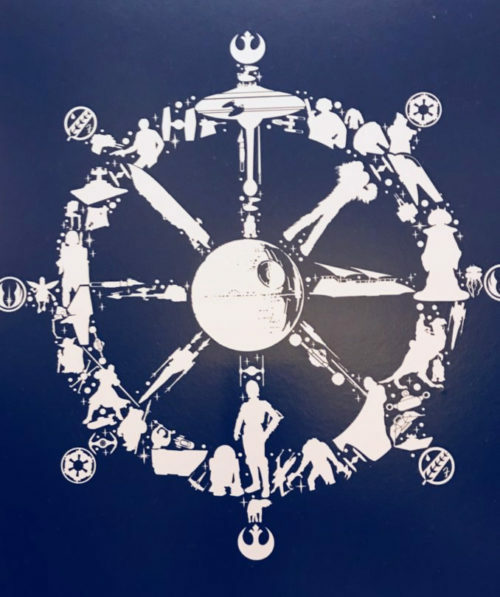 When I say “I love you,” Star Wars says “I know.” During Star Wars Day at Sea, I was in heaven. Warwick Davis, not so much. 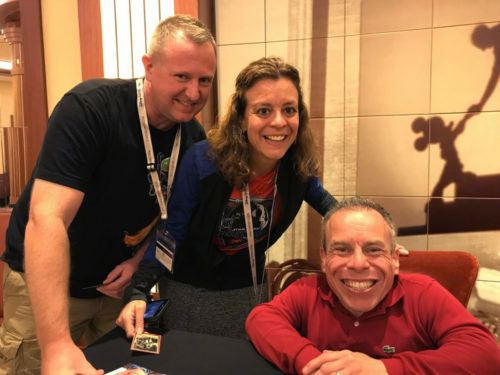 Like Obi-Wan Kenobi and Anakin Skywalker, Warwick Davis and I were destined to have the kind of BFF relationship that ends with him chopping off my arms and legs on a lava planet out of sheer annoyance. In the days leading up to Star Wars Day at Sea, Warwick was everywhere. I made sure of that. On my way up to breakfast on Day One, I stepped into the elevator to find Warwick Davis waiting for me, as if ready to banter about saving me from a nest of gundarks. The next day I ate brunch at the table directly next to him and pretended not to eavesdrop on his conversation with his traveling companions. I wanted to recommend the blue milk but played it cool. It was still early in the sailing. There was time for the relationship to blossom. That night while browsing shops before the big musical production of Disney’s Aladdin, I nearly tripped over him examining the Star Wars merchandise — Wicket the Ewok coin purses, if you can believe it. This time I tried a joke, something about not seeing the resemblance. He didn’t laugh. He probably didn’t hear me. I consoled myself by purchasing this ultra cool stateroom door magnet. It got so strange that at one point, my wife shared the Rainforest sauna with Warwick, his wife, and literally no one else. For the uninitiated, the Rainforest room at Disney’s Senses Spa & Salon is the best value in all of Disney Cruise Line. The Rainforest room is like Naboo, where everything is soft and smooth. Most people only fantasize about half-naked moments with Star Wars movie stars. The Rainforest room makes it a reality. No wonder Jabba thinks I’m a weak-minded fool. We did a loop through the Chewbacca line, bailed on Darth Vader, then headed up for the pool, where Stormtroopers, Boba Fett, and a couple of Tusken Raiders were looking for Rebel spies. I was looking for Princess Leia bikinis. I didn’t find any, but I did spot Warwick Davis going through the breakfast line. I walked over to say hi but got scared off by all the Crew Members waving wet-naps in my face like a bunch of mynocks. Unless a Sith lord has severed your hands in battle, no appendage escapes the Disney Cruise Line sanitation process. We couldn’t linger on the pool deck, because we had very important plans for later that morning. 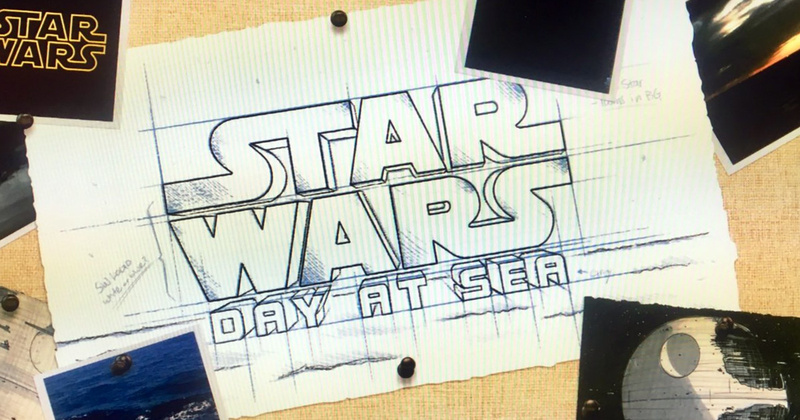 My good friend Warwick Davis was scheduled to present a 45-minute show exclusively for Star Wars Day at Sea in the Buena Vista Theater. On our way through the Disney Fantasy atrium, we were accosted by Zam Wessell, who was patrolling the area along with some of the characters from Star Wars Rebels. We took a picture and kept moving. We showed up for Warwick’s presentation and scored seats on the right side of the theater, a few rows back from Mrs. Davis herself. During the show, Warwick was his usual engaging self, telling hilarious stories about his Star Wars days and showcasing a variety of unique clips. During one part of the presentation, he attempted to set a world record with the most selfies in one minute. But for some reason, he only went down the left side of the theater. I’m sure it was an oversight, so I made everything okay by hitting him up for a quick selfie down by the stage at the close of the presentation. Somehow he’s the tallest one in this picture. After lunch, it was time for more Star Wars encounters, including a viewing of The Last Jedi — which I had to leave early to get in line for Warwick Davis’s official autograph session down near the Walt Disney Theater. 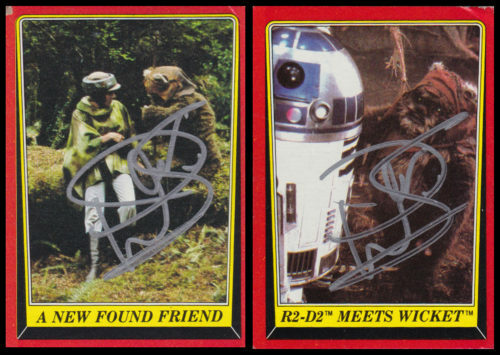 Hoping to impress him, we had brought along two vintage Return of the Jedi trading cards from 1983, both featuring Wicket the Ewok. With a solemn face, Warwick admitted to being impressed and signed both of them. Strange, then, that he did not acknowledge us later in the Rainforest room when we spotted him gathering towels. 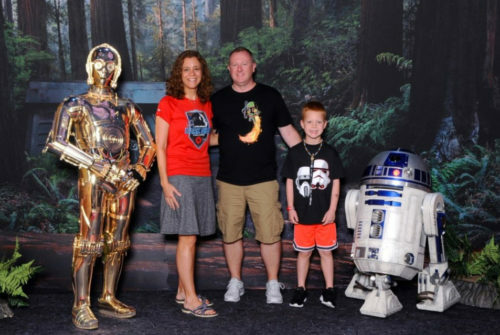 That night, our family made our way onto the main deck to take in the Star Wars character show and fireworks extravaganza that concludes Star Wars Day at Sea. Warwick was nowhere to be found, so we took a circuitous loop through the concierge level on Deck 11 to see if everything might be okay. Unfortunately, too many of the suites had their doors shut. I ended up back where I started, in my stateroom, listening to John Williams music. I wondered if Warwick Davis had simply tired of me. Is it possible, I wondered, that Star Wars celebrities have had too many encounters with crazy fans? I mean, I think I’m a nice guy. Fun to hang out with. All I wanted was a few moments with one of my heroes. Swap some stories over an overpriced fruity concoction from Disney Cruise Line. Exchange email addresses. Maybe see if he wants to team up for a run at WDW49. To feel better, I joined my friend Chris for the evening entertainment — a full-on Star Wars gameshow in the Tube Lounge. They played through several grueling rounds, whittling down contestants until only one remained. 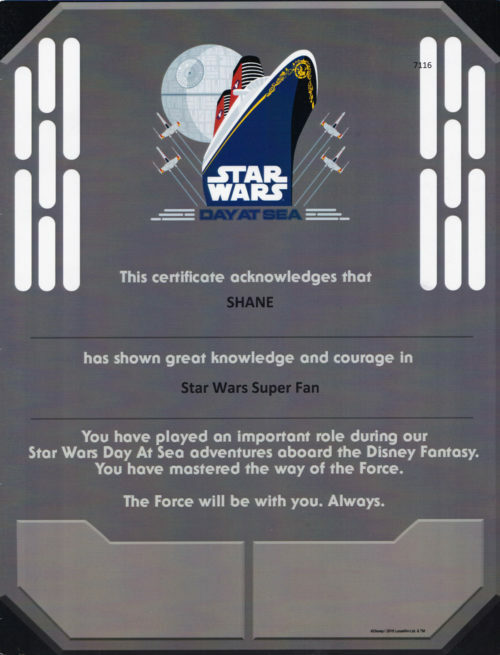 And wouldn’t you know it, I was declared the Star Wars Day at Sea Super Fan for that sailing. They asked for my stateroom number to deliver my prize package. I expected a little more. For all I know, Warwick Davis had such a bad experience on the Disney Fantasy, he may never do Star Wars Day at Sea again. I’m afraid Warwick will retire from the fan circuit. You other Star Wars fans will be stuck with Pablo Hidalgo. 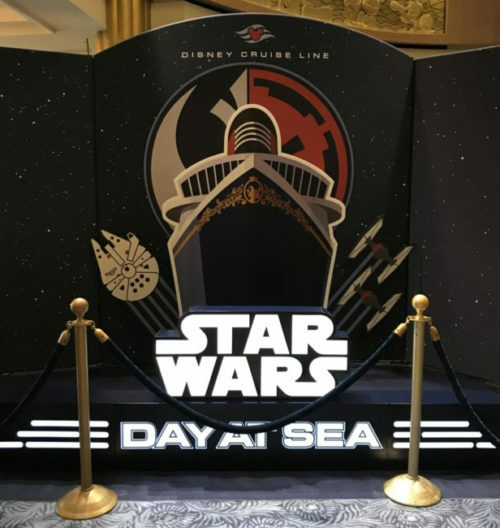 It’s enough to make Disney Cruise Line cancel Star Wars Day at Sea forever. That night, I went to bed wishing that Warwick would have just given me a chance. But opportunity only knocks once. At least I’ll always have the trading cards. This entry was posted in Theme Park Life and tagged animator's palate, Disney Cruise Lines, disney fantasy, Star Wars. Bookmark the permalink. YEESSSS, This Story wins on so many levels. 2. Your comedic poke at yourself, disney, warwick davis, and obviously Phantom Menace, for Warwick Davis’s amazingly ridiculous performance. Please please please stalk other obscure Star Wars actors. Like whoever played Bazine Natal in force awakens, or the person responsible for for the voice over of the Goom Robot. The Goom Robot is high on my list. And I really appreciate the kind words! Don’t worry, Shane. At least Mr. Davis isn’t as universally hated as everyone’s favorite Gungan. Warwick is actually pretty great. And even Jar Jar is starting to feel like a weird old lovable uncle by this stage. Warwick seems like the type of guy that would actually be up for the #wdw49 challenge. Have you ever seen the show An Idiot Abroad? He’s one of the funniest and most friendly of the Star Wars cast members I have met. (My brother got fourth place during the adult trivia challenge Warwick hosted during one of the Star Wars Weekends, would have went further but he couldn’t remember the color of Sebulba’s podracer). The article is tongue in cheek. 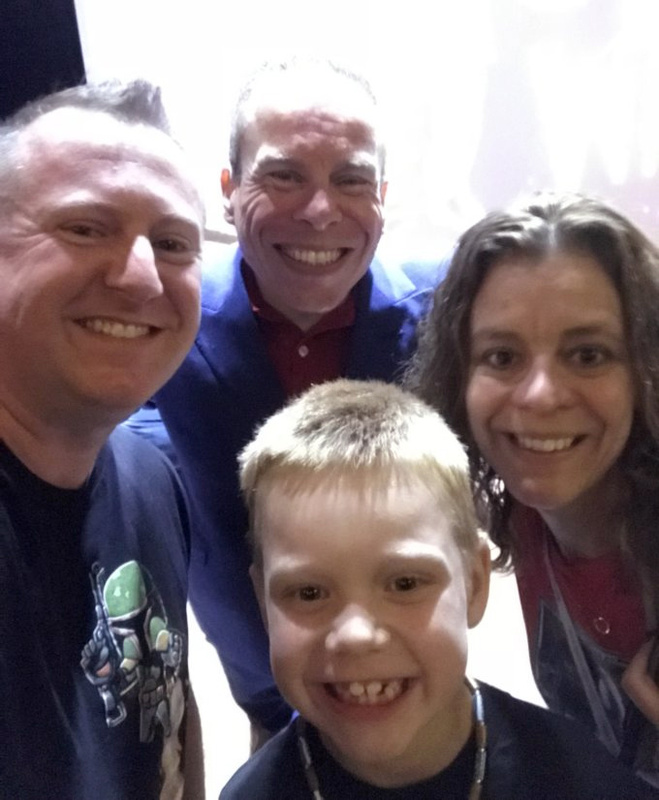 Warwick Davis is phenomenal and Star Wars is extremely lucky to have him as an ambassador. Doing a WDW49 run with him would be a dream come true. But I’m embarrassed to say, he might not meet the height requirements for some rides! It’s your eyes, brother. They’re a dead giveaway. I’m sure Mr. Davis knows crazy when he sees it. How was the cruise overall? I’d like to see a write-up on it with your tips and recommendations. Also, can we expect a shot at WDW49 in the fall from you and Ted? I watched Empire again last week. Even though you win, you could have won MUCH sooner if not for that bogus Hoth question. Star Destroyers. They saw Star Destroyers first. It’s Empire 101.